Many iPhone and iPad users like to play YouTube videos in the background, often for listening to music or listening to a podcast or talk show. For example, maybe you found a great song on YouTube that you want to enjoy while playing a game, or while practicing a foreign language, or maybe you simply want to listen to the YouTube video in the background while you’re doing anything else. Playing YouTube videos in the background of an iPhone or iPad is desirable for many reasons, but it’s no longer as simple as just pressing play and then returning to the Home Screen of iOS. 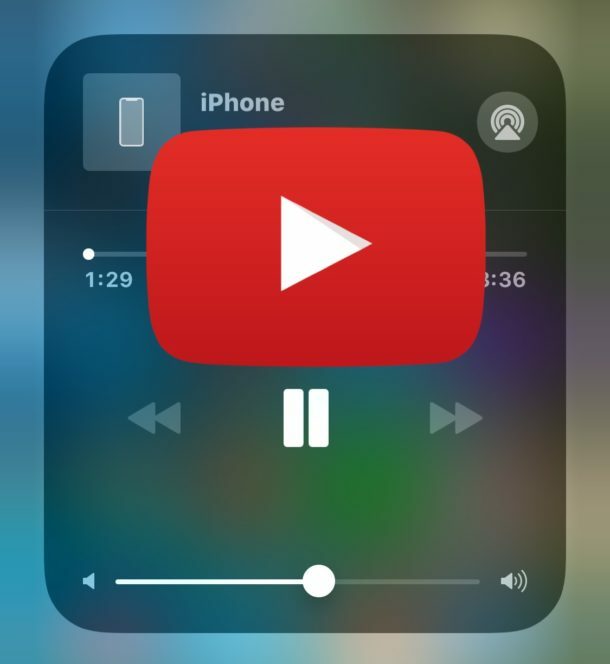 This tutorial will show you several different ways to play YouTube in the background on an iPhone or iPad, and the methods discussed work in both iOS 12 and iOS 11. This has been tested and confirmed to work on any playing YouTube video in the background on both an iPhone and iPad with Safari in iOS 12 and iOS 11. If you’re having any difficulty, just repeat the steps. It’s important to use the “Request Desktop Site” feature in iOS Safari, as is switching to a different tab in Safari before leaving the app. Leaving out either step will cause the background video playing to fail. Also, make sure you watch the YouTube video in Safari and not the YouTube app for this to work as described. Another option that works to play YouTube videos in the background is to use a different web browser. For example, many users report luck playing YouTube videos in the background from the Opera, Dolphin, and Firefox web browser apps in iOS. Your results may vary, but share with us what works for you in the comments below. The method used in the screenshots here is the first approach outlined above, involving Safari Request Desktop -> Play YouTube Video -> Switch Safari Tabs -> Leave Safari to continue playback in the background. As you probably have noted, the task is of backgrounding YouTube videos and listening to the audio track elsewhere in iOS is becoming more challenging, and many of the methods that used to work to play backgrounded YouTube no longer work in iOS. For example, the method of playing YouTube in the background on iOS 9 and iOS 8 does not work in iOS 12 or iOS 11, so instead users of the new operating system will have to follow the instructions outlined above. Which method are you using to play YouTube videos in the background on an iPhone or iPad? Do you have another solution that isn’t mentioned here? Share your own experience listening to YouTube in the background of an iOS device in the comments below! You do realize that you can also press and hold the “reload page” icon on the right side of the address bar of safari to open a pop up menu which also allows to request the desktop version of the site. Quickly double clicking the power button to lock the device to keep the video playing doesn’t work on iPhone X.
It’s working great for me, thanks. The video still plays. Great tip, works on iPhone X and 2018 iPad, iOS 12. Thanks. Now this is some helpful info. Thanks. It’s worth noting that you can pay Youtube $15/month and it automatically plays vids in the background unless you stop the vid. Also note: the content creator gets his cut of the ads you didn’t see because of this. One guy who creates vids told me that. I am happy with it. I listen to enough vids to make worthwhile. I didn’t know when I signed up but it also includes a music streaming app but it doesn’t have much selection. Don’t consider this if you are trying to decide, unless they’ve improved it. But how do U turn off the background video sound or music? I use a shared iPad at a yoga studio to sign in members. When I turned on the sign-in app (MINDBODY), there was music playing. I didn’t know how to turn it off. So tried this many times on an iPhone X and unless I’m missing something the instructions don’t exactly work. What does work is just hitting play and leaving Safari which would stop the video but then all you have to do is hit play from the control center and that works. No need to open new tab. Problem with your instructions I kept running into was that once you request desktop site the video plays in full screen so there is no way to create a new tab. Exiting full screen pauses video and hitting play again goes into fullscreen. Definitely never had to create a new tab but just playing around with the control center play button made it work. It works on iPhone X as instructed, but it sounds like you came up with another way to do it too. I can’t replicate your playback approach without a new tab or desktop site however. I think your assumption about missing something in the instructions is correct because I am using it as described, but I can’t do what you described which I guess if it works then it is no matter. For me, backgrounding Safari and trying to play from Control Center doesn’t work unless you put it into Safari Desktop Version of YouTube, and YouTube.com appears to pause the video by default unless it’s in desktop mode which is why I assume it must be the desktop site requested. As for the video keeps going fullscreen you just have to exit out of full screen mode and play it in the browser without using the full-screen playback. The tap targets are small so maybe you are hitting something with a finger unintentionally. Anyway, it makes you wonder why YouTube is making this difficult… is it agreements with video posters to not use YouTube as a streaming music service like Spotify? Or what gives? Any ideas? Maybe it is Safari and not YouTUbe? Obviously YouTube want you to see Ads. Or you can use this application “downtube, it’s a free application. I am using the uc browser program while I am constantly using YouTube on my iPhone phone. There’s no problem with the background. Not sure it was just me, but this method won’t work with safari on ios 12. I used chrome instead and tried this same method and it worked! It works to play YouTube videos in the background in iOS 12, I use it on my iPad for playing YouTube in the background with iOS 12 frequently. This doesn’t work on ios12 on my iPad. Or your directions don’t work using the website. #8 open a new tab. YouTube turns off. Yes it does, it works in iOS 12 on iPad, you just have to follow the exact instructions as detailed. What you meant to say is that you can’t get it working properly, likely you missed a detail somewhere. Open YouTube, request desktop site. Play the YouTube Video in the desktop site on iPad Safari. Then open a new browser tab in Safari, the tab will keep playing audio. Now you can switch apps from Safari and the YouTube video plays in the background. I use this constantly, it works exactly as described but if you skip any instruction or detail it will not work. You probably did not request the desktop YouTube site, that is a requirement, then open a new tab, that is a requirement. For everyone frustrated with these methods like me! I found that desktop version of youtube on safari automatically plays in full screen. So instead if opening a new tab, I play ful screen then push home button. Seems to work perfectly for me! FYI…those having problems, this ONLY works on iPad; does not work on any iPhone models running latest iOS. This works fine on iPhone, using it today with latest iOS to play background music from YouTube on my iPhone over Bluetooth. Request desktop site, play video, switch apps, use Control Center to play video again. Works, plays the Youtube videos audio / music in the background. I tried doing this on my iPhone 8 running iOS 12.1 and when I hit the power/lock button twice the video still stops playing. I guess YouTube/Google disabled the workaround in the newest version of their app. This worked for me in iPhone7- ios 12 after a long struggle. I opened the safari browser with the youtube playlist -> then changed to “Request desktop” and logged into the youtube with the credentials. when u play from the browser we need to confirm from the control center are we getting the youtube playing instead of the music player icon. Actually, I’m currently watching YouTube in the background on iPhone 7. No YouTube premium, no browsers tricks, no apps, no paid programs. Just straight up YouTube app, playing on the background for free. HMU for tutorial on how to do it. The first list of instructions worked for me on iPad. Other instructions I found in other places did not. I can browse other pages, use other apps, and even put it to sleep and music keeps playing. Thank you!